People who live in Burns, the small high desert town near a wildlife refuge that has been occupied by an armed group for a month, say they are sick of the disruption to their lives. Four people occupying an Oregon wildlife refuge held their position Saturday and posted live videos describing their situation and reiterating their demand that they be allowed to leave with being arrested. The jailed group’s leader, Ammon Bundy, and 10 others who were arrested earlier in the week remained in custody. Through his lawyer, Bundy on Saturday again called on the remaining occupiers to leave. The FBI has said it’s trying to resolve the situation peacefully. Kate Marsh, an artist in town, said many residents work for the government, while others have their livelihoods depend on government agencies. “There is some dissension in the community,” Marsh said. The only woman arrested so far in the standoff, Shawna Cox, will be allowed to go home while her case makes its way through the court system. But Beckerman said that won’t happen until after the armed occupation ends. Ammon Bundy’s lawyer, Lissa Casey, said her client is not aligned with those remaining at the refuge near Burns and he wants to go back to his family. Court documents detail some of the evidence against the occupiers. The charges against the defendants say the refuge’s 16 employees have been prevented from reporting to work because of threats of violence. 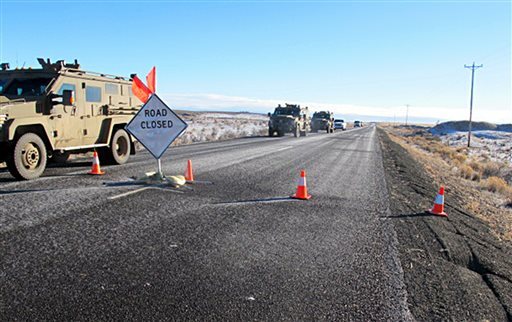 Robert “LaVoy” Finicum, the group’s spokesman, was killed Tuesday night in a confrontation with the FBI and Oregon State Police on a remote road. Bundy and four others were arrested during the encounter. The FBI on Thursday released a video showing Finicum’s death, to counter claims he did nothing to provoke his killing. In the aerial video, Finicum is pulled over in his truck but then takes off in the vehicle and plows into a snowbank because of a roadblock. He gets out and has his hands up at first, then appears to reach toward his jacket pocket at least twice. He is shot and falls to the snow.